A few years ago, before Google and Yahoo took dominate control of the search engine industry, there was a huge move towards innovative search engines. Cluster search engines worked on the data clustering theory that categorizing groups of information makes finding specific information faster and easier. Enter the Keyword Map known as KWMap. 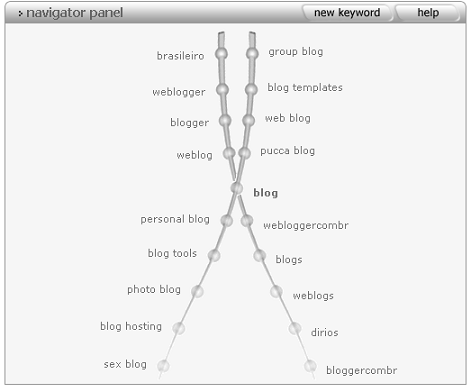 This keyword searching tool presents keywords in a graphic format based upon their relationship to the related groups. KwMap.com is a complex keyword refining tool, aiming to help you discover new keywords. It is a fact that search engines can only help you in finding something if you know the right keywords. KwMap.com runs on a multi-gigabyte database of keyword inter-relations. You can search all common concepts and you will be presented with related keywords (eg. ‘car’ -> ‘wind shiled’, ‘formula 1’, ‘bmw’) and keyword variations (eg. ‘car’ -> ‘car parts’, ‘car insurance’, ‘rent a car’). We also run pertinent links associated to most of the keywords. You enter in your keyword or phrase and a chart map is generated with axes. One is for keywords which are different but related to your search keyword. The other contains keywords which contain your search keyword. The most relevant keywords are usually found in the middle and the least relevant words found towards the outside of the chart lines. To navigate through the chart to the information you are looking for, click on any of the keywords. When you are faced with wanting information but you aren’t sure of the keywords, this novel visual approach can help. I’ve found keywords related to the topic that I wouldn’t have thought of, helping me narrow in on exactly what I’m searching for. It’s also entertaining. It’s a great way of finding keywords for your website or blog to work on your keyword density. This entry was written by Lorelle VanFossen and posted on October 20, 2005 at 10:37 am and filed under Web Wise. Bookmark the permalink. Follow any comments here with the RSS feed for this post. Post a comment or leave a trackback: Trackback URL.